If nothing else, I have to credit the game Carcassonne with informing me that there was an actual city named Carcassonne. While that might seem educational, it's not really a game about history, unless you study history that consists predominantly of placing tiles. 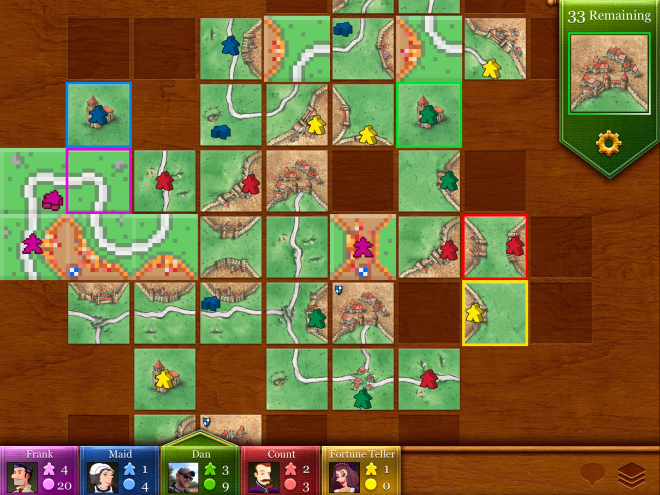 Like oh-so-many of my favorite mobile games, Carcassonne is an adaptation of a board game of the same name. Your goal in Carcassonne is to score the most points, which you accomplish by building cities, roads, cloisters, and fields. Every turn you place a tile on the board, connecting it to the larger tableau and, hopefully, adding to your existing constructions. While the tile you have available every turn is random, your job is to try and find the best spot on the board to place it, whether it be to your advantage or your opponent's disadvantage. But, naturally, there's a catch. At the beginning of each game, you're given eight humanoid looking figures (dubbed "meeples"); in order to score points for a particular construction, it needs to be occupied by one (or more) of your meeples. When you place a tile, you also have the option to put a meeple on it—in most cases, you'll get the meeple back when you complete the object: finish the road, close off the city, surround the cloister with other tiles. However, once you place your meeple in a field, he's stuck there for the rest of the game, so choose wisely. At the end of the game, you'll get a few points for unfinished constructions occupied by your meeples, as well as those fields. I confess, I'm merely mediocre at Carcassonne—my record isn't quite as bad as it is at Hero Academy—but I've still long enjoyed the game in both its physical tabletop and virtual incarnations. Somehow, the long view always eludes me; that's not quite as damaging in Carcassonne as it can be in other games, but when you get to the end of a game and see your opponent's racked up dozens of points on fields, while you have a measly three, well, it can be disheartening. But if nothing else, TheCodingMonkeys terrific adaptation of Carcassonne provides a high bar for other board game conversions, for several reasons. Beautiful: Even before it was optimized for the Retina display, Carcassonne was a gorgeous piece of art. From the carefully rendered tiles to the textures behind the menus, it's simply beautiful. Naturally, Retina support has made it look better than ever; sometimes I feel like if I zoom in far enough on the tile, I'll see little townspeople waving at me. But that might be just me. 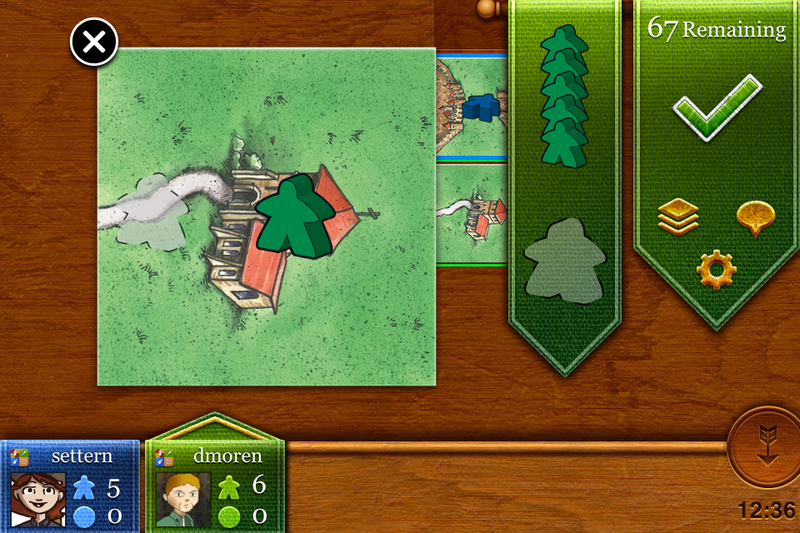 Wake up, meeple: The iPhone version of Carcassonne is perfect for playing a friendly game when you're on the go. Versatile: You can play plenty of Carcassonne by yourself, if you so choose, using its Solitaire mode, which challenges you to construct a city in a particular fashion. You can even challenge your friends in that mode, by sharing your high score. But the real fun of Carcassonne comes by squaring off against one or more friends (or enemies). You can do so either in a Local mode that supports pass-and-play or over Wi-Fi or Bluetooth, or you can go farther afield and play versus opponents on the Internet, choosing from friends, Game Center contacts, or even random strangers. Just be aware that there are some pretty savvy players out there, so you might find yourself in a fight for your very survival. Expandable: I've had plenty of fun playing the basic version of Carcassonne, but the tabletop version has eight full blown expansions and something like a dozen smaller add-ons. The developers of the virtual edition have only added a couple of these so far—The River and Inns & Cathedrals—but also offers a couple other options (the ability to play with no fields, for example). But more expansions are on the way; TheCodingMonkeys has announced that it plans to release the Traders and Builders expansion later this year. This story, "You Should Play: Carcassonne" was originally published by TechHive.